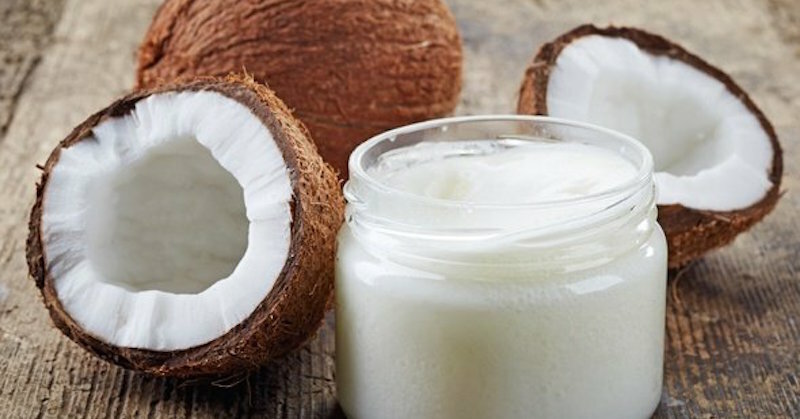 We have established why coconut oil is loaded with healing properties for soothing eczema breakouts. There are many ways of using coconut oil for soothing and healing eczema flareups, and we will discuss some of them below. Coconut oil solidifies below 75F, so you are more likely to see it as a white, petroleum jelly-like substance. But it almost always remain a liquid in warmer tropical climates where coconut trees grow abundantly. The semi-solid to solid state of coconut oil in colder places doesn’t make it difficult to apply, though. Take a teaspoonful of coconut oil in the palm of one hand. It readily melts into liquid as soon as it comes in contact with skin. Once melted, you can apply it on the eczema-affected skin exactly the way you apply lotions. You can gently massage it in without irritating the skin. When applied in small quantities, the oil gets almost completely absorbed into the skin, and you are left with non-greasy skin sans dryness and roughness. Repeated application may be done, if necessary, but for mild eczema, a single application of oil twice a day will keep the skin moisturized. Related: Learn how you can apply neem oil on inflamed skin for healing. If the skin is too rough at places and is prone to break up, apply an oil bandage on the spot to soften the skin. Warm a tablespoon of coconut oil and dip a cotton pad in it. Place the oil-soaked pad over the rough spot and allow it to remain for 15-20 minutes. Afterward, sponge off excess oil with tissue paper. This is an excellent treatment during eczema flare-ups. It gives tremendous relief from night time itching too, so it is especially beneficial for children who find it hard to fall asleep due to the itchiness. Bandaging it will also prevent further scratching and worsening the condition. In infants and young children, eczema usually appears as dry, flaky areas of skin with a reddish discoloration. A coconut oil massage before a bath can keep the skin condition from deteriorating further. You may even see a reduction in dry patches. Warm up 3-4 tablespoons of coconut oil, and apply it to eczema prone areas like cheeks, neck, tummy, elbows, knees, hands and feet. Massage in the oil gently with a circular motion. Allow some time, 20-30 minutes maybe, for the oil to absorb. Widespread eczema in older children and adults can be treated with a comforting warm water bath to which 3-5 tablespoons of coconut oil can be added. You can also add a teaspoonful of skin-friendly essential oil like lavender or tea tree for a fragrant bath with additional therapeutic value. Let the bath water naturally dry on the skin, or sponge it off with a soft towel. This bath will leave the skin soft and supple, and provide restful sleep, relieved of itching. Related: Find out how you can use this super detox bath to greatly relieve and soothe eczema. Diet has an impact on eczema. Although it’s rather difficult to identify the food items that lead to flare-ups, avoiding known food allergens usually helps control the condition. People with an egg allergy often experience long-term remission when eggs in all forms are avoided. But taking coconut oil also seems to help, probably due to its immune-modulating action. Anyone, even children, can take 1-3 teaspoonfuls of coconut oil daily. You may experience nausea-like symptoms initially, but this will resolve itself once the body gets used to it. This is an old detoxification technique people effectively use to clear skin blemishes. It involves swishing around a tablespoon of vegetable oil in the mouth or just holding it in for up to 20 minutes at a time. Well, 20 minutes may be for veterans, but anyone can try it for 5-10 minutes. It is ideally done in the morning on an empty stomach. Oil pulling reportedly clears acne, eczema, psoriasis and sinusitis, and help with a variety of other problems, not to mention its dental health benefits. Coconut oil is the best option for oil pulling because of its mild taste compared to the other alternative, sesame oil. Start with one teaspoonful of warm, liquid coconut oil and increase the quantity gradually. It is best to rinse your mouth with warm salt water after spitting out the oil. One important thing to remember is that you shouldn’t swallow the oil, so this is not a procedure for children. Thanks to the increasing popularity of coconut oil, the market is inundated with several types of this oil. There are cold pressed, expeller-made, centrifuged or solvent extracted coconut oil. Depending on the purity of the oil, you get refined and unrefined oil; the refined oil may be bleached and deodorized, as in the case of RBD coconut oil. The refining processes involve chemical agents that leave their residues in the end products, something we want to avoid, especially when using the oil for treating skin conditions like eczema. Choose only pure, unrefined coconut oil for all skin and hair care applications. Although coconut oil is relatively stable when heated, you may lose out on many heat-sensitive bioactive agents in the oil that could be responsible for some of its beneficial action. Test different virgin coconut oil samples and choose one that has mild coconut flavor for skin care. Another thing to look for is the ‘organic’ tag. There’s no way to determine the veracity of such claims, but you’d want to play as safe as you can. 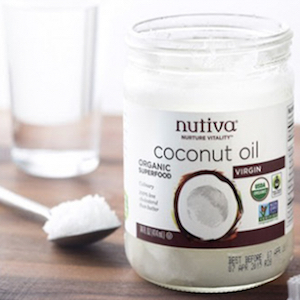 Nutiva Coconut Oil is widely regarded as one of the best coconut oils available on the market and is also my favorite brand to use. You can purchase it here. Coconut oil can be safely stored for a year or two without refrigeration at temperatures below 75F. Use wide-mouthed glass bottles to store it, and always use a clean, dry spoon. Test a drop of coconut oil on your inner wrist or in the elbow fold before using it for skin applications.